Some may say we are a nation of over-consumers. Who can deny enjoying the occasional fast food and good day of shopping? It is estimated that 50 million people visit quick-service restaurants each day, while 154 million consumers shopped in stores and online on Black Friday 2016. We want stuff fast, we want it cheap and then, it seems, we just throw it away. Most products we buy are delivered in single-use plastic packaging, from our fast-food containers and water bottles to grocery produce and shopping bags. According to the EPA, we use an estimated 380 billion plastic bags and wrappers each year in the United States, which equals nearly 1,500 per adult in the U.S. population. All of this may sound a bit alarming, but there are easy steps we can take towards a greener society — and what better time than the new year to kick start this movement! Plastic packaging has revolutionized the consumer-product industry, providing benefits like increased shelf life of food and reduced transportation costs from the lighter weight. 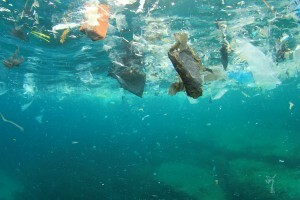 But for all its convenience, this plastic waste also comes with a hefty price tag in both economic and environmental costs. Only 14% of pla stic packaging waste in the U.S. is collected for recycling, representing a loss of billions of dollars in what could be recovered material costs. A majority of this waste will either sit in landfills for centuries or wash down storm drains and into our waterways and oceans. So how can we redesign this “take, make, use and waste”, or linear-economy model, into a more sustainable system? From producer to consumer, we are all part of the solution in transitioning to a circular economy—this means we can limit the amount of plastic that enters the waste stream in the first place, and instead, transform it into reusable products or nutrients that are transferred back to the environment in a cyclical, renewable process. Manufacturers can lead the way to this “new plastics economy” by developing products that are recyclable and contain recycled material, ensure clear labeling that indicates recyclability and use less material in the overall design. Additionally, companies are creating new bioplastic products sourced from renewable biological materials (instead of primarily fossil-fuel based) and/or are biodegradable in the environment. We have previously reported on some of these innovative new products, including CocaCola Co.’s PlantBottle™ and a chitosan-based plastic wrap. On the consumption side, businesses can commit to using more recyclable and recycled-content packaging materials, provide recycling bins for customers and advocate for more recycling and composting services in their communities. And as consumers, we can take easy steps to change our behavior and reduce waste, like opting to use washable dishware at gatherings and taking along reusable shopping bags during shopping trips (see also these “10 Ways to Unpackage your Life”). Governments too are taking action to reduce plastic waste, with many countries and states banning or taxing single-use plastic shopping bags. And France is taking this one step further through its Energy Transition for Green Growth Act with plans to ban all plastic dishes and cutlery by 2020. No matter what your new year’s resolution for 2017 is, as a society we can make it a goal to reduce, reuse and recycle to continue the push to a greener and healthier earth for centuries to come. Author’s note: The author shamefully acknowledges that she was indulging in fast food as she wrote part of this post. She did, however, bring her own re-usable coffee cup and tries to take any recyclable utensils and wrapping home to add to her recycling bin.